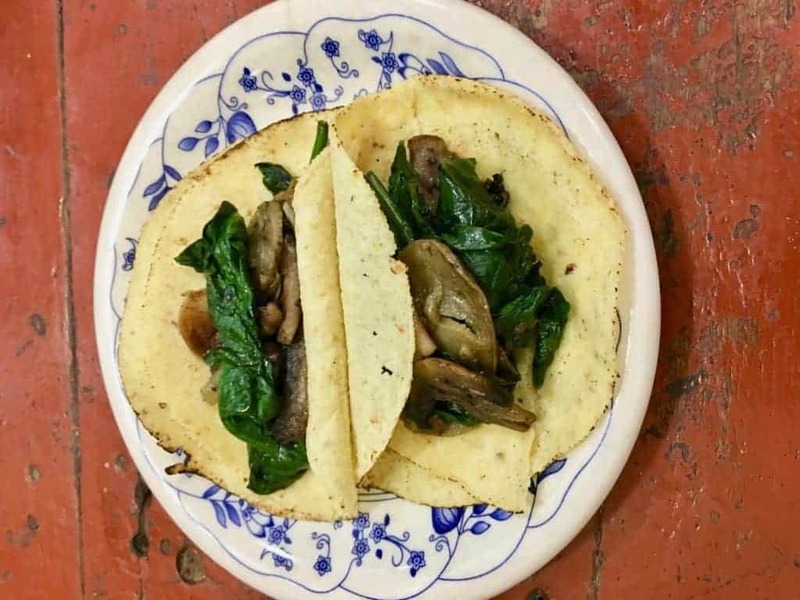 Vegetarian tacos? Yep! 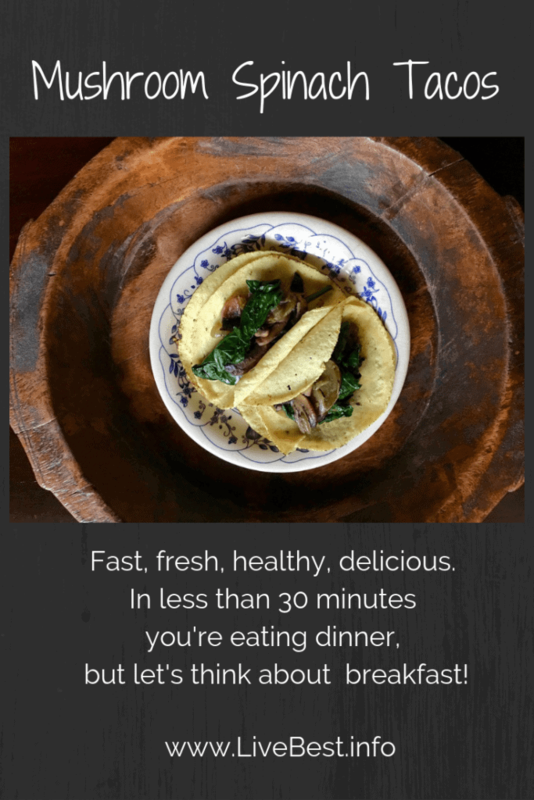 Mushroom Spinach tacos are a quick dinner recipe. Fast, fresh, healthy, and delicious. In less than 30 minutes you’re eating dinner, but let’s think about Taco Tuesday breakfast. It’s nothing new that vegetables are good for us, right? The problem is how to make them interesting. A side of canned green beans doesn’t offer much excitement. A spoonful of peas doesn’t really inspire. Corn. Again? Quick dinner recipe? How about a roasted veggie taco? This is a quick dinner recipe! 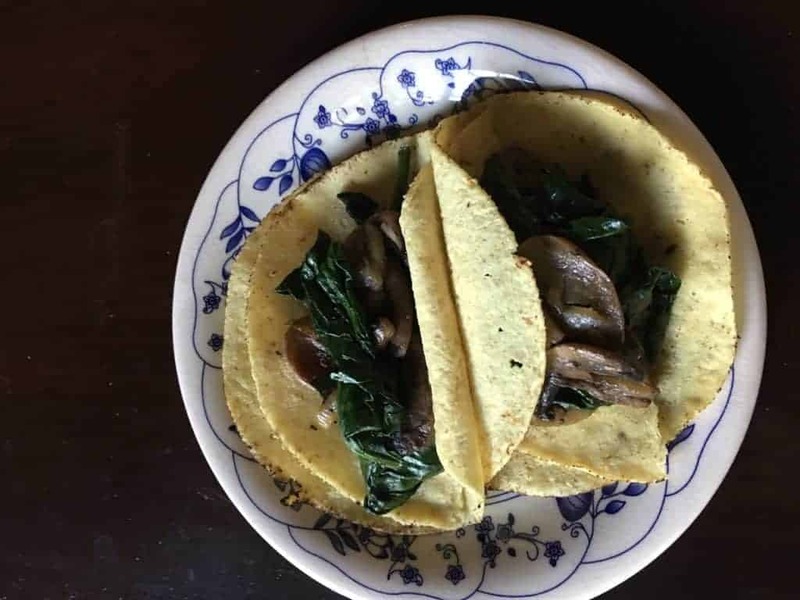 In this easy one-pan recipe, I sautéed mushrooms and wilted spinach to fill a taco, vegetarian style. But you won’t miss the meat, you’ll just reach for another tortilla to fill. At the store, look for fresh spinach that is not wilted. Check the date. The Sell-buy date is a suggestion for the store to sell it, still leaving you time to use it after you buy. The Use-buy date is, a suggestion for best results. But you should use it within a couple days after buying because the longer it’s stored the more vitamin loss. Leafy greens, such as spinach and lettuce, are best kept cold. Store it in the vegetable drawer as soon as you get home. We’ve probably all thrown out a bag of brown goo that was once lettuce. Now that’s real vitamin (and money) loss! Fresh vegetables are what we toss the most. Produce doesn’t age well. From the farm to the store to your fridge, the clock is ticking. So try to use them as close to purchase as you can. Vegetables often end up in our grocery cart because of their healthy halo. We know we should eat them, so we buy them, but then find them weeks later in the fridge. Does this happen to you, too? Keep in mind how much you will eat through the week to avoid buying too much. A good deal at the store doesn’t translate if it ends up in the garbage. A 2015 study from the University of Arizona found that we pay close attention to sale prices, but not the money squandered through wasted food. Choose mushrooms that are smooth with tightly closed caps. If the gills under the cap are showing, the mushroom is old. Mushrooms absorb water, so rather than rinsing them, the best way to clean them is to rub them with a damp paper towel. Slice the mushrooms in similar sizes so that they cook evenly. Or save time and just buy them sliced. Cook’s note: Slice the mushrooms in similar sizes so that they cook evenly. For a cup of mushrooms, I use a serrated edge paring knife. Even though we ❤️ us some shrooms, we want them to brown, not steam, so give them some room. 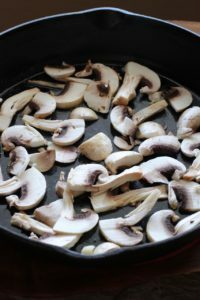 Don’t crowd the mushrooms in the pan. To smash garlic, place the clove on the cutting board. Lay the flat part of a knife blade (sharp edge away from you) on top on the clove, then hit the flat part of the knife with the heel of your hand. Be careful to stay away from the sharp edge. I use a Chef’s knife because of the wide blade. Smashing releases the compounds that give garlic its pungent flavor and healthful benefits. Let the garlic rest for 10 minutes before cooking, to allow those compounds to work so you maximize the healthy benefits. Now that we’ve got the ingredients lined up, let’s get going. In a large skillet, melt butter and oil, over medium heat, add mushrooms, thyme, garlic, salt, pepper and red pepper flakes. Stir occasionally, cooking 10 —12 minutes, until mushrooms are softened and browned. Stir in fresh spinach just until it wilts, about 3 minutes. Remove thyme stems and garlic clove. Spoon some of the mixture onto a warm tortilla and add some salsa. 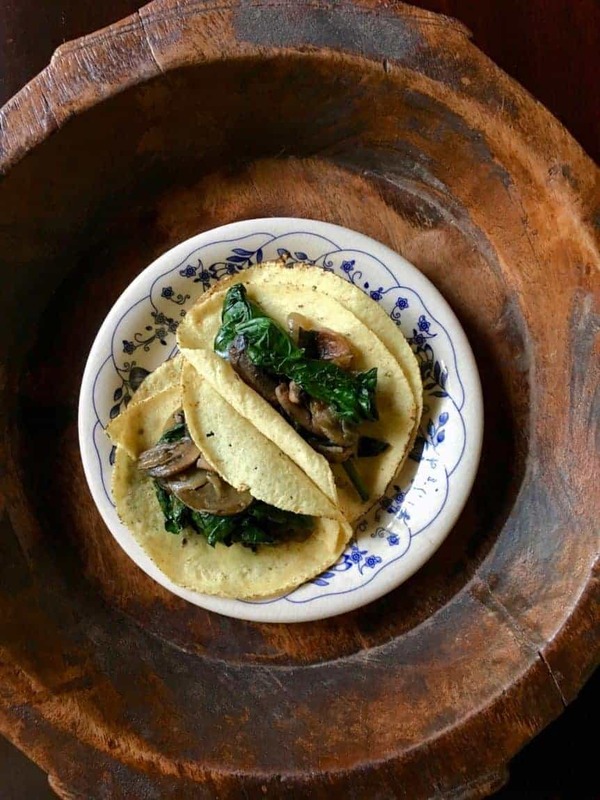 Mushroom Spinach Tacos are great for dinner, but think about breakfast. I know! Or the spinach mixture could be rolled in a tortilla and topped with salsa verde for an enchilada or stirred into scrambled eggs for breakfast. However you serve it, I think you’ll find them delicious. Colorful, fun plates make the menu! Feel like spinach? Try these! P.S. Want more healthy diet tips and recipes? Sign up for my newsletter right here. Disclaimer: This email includes affiliate links, and I could earn a commission if you purchase through these links. Please note that I’ve linked to these products purely because I personally use and recommend them and they are from companies I trust. There is no additional cost to you. Get my delish, nutrish recipes, featured on top magazine websites, plus health & wellness tips delivered straight to your inbox! My book can help you live even better. Simple solutions for fresh foods and well-being. Available on Amazon. FREE Leader Guide available on Products tab! 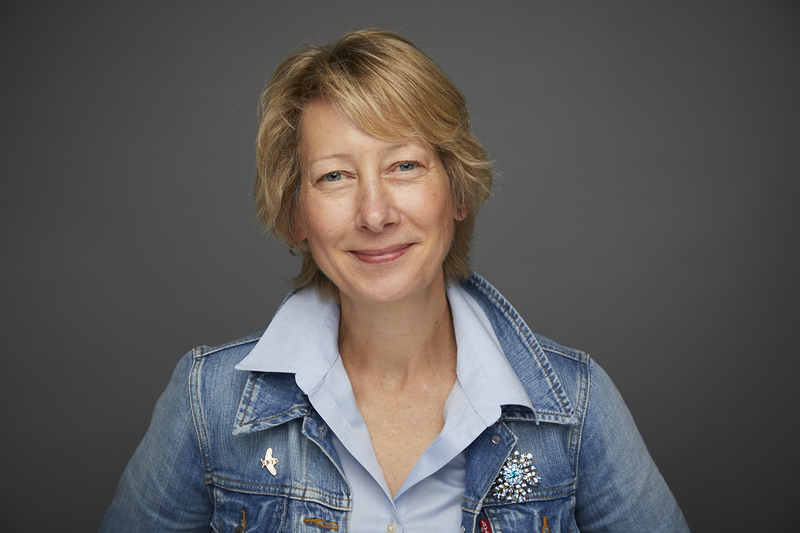 Do you need a touch up, a refresh, a reboot for a happier, healthier, stronger you? 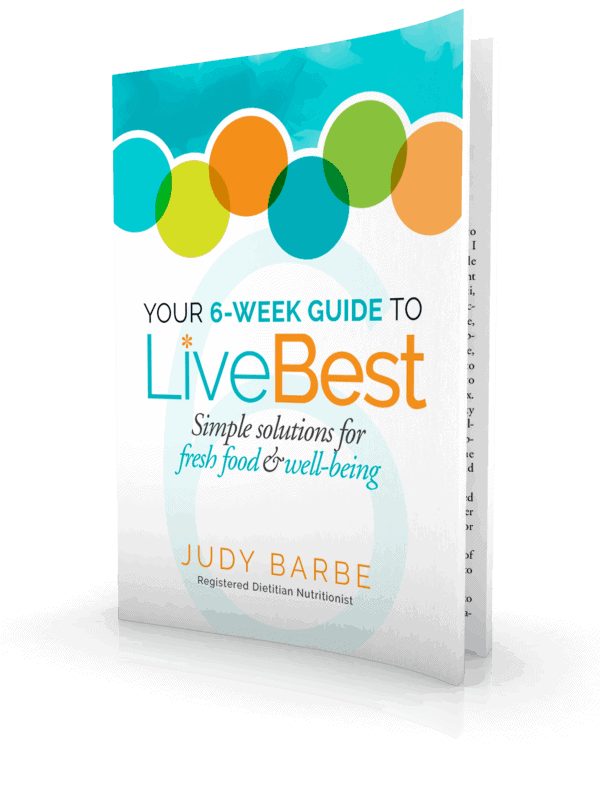 You Must be Present to Win webinar series guides you to simple, practical solutions to transform you diet in just 6 weeks! For example, you’ll learn: Easy ways to eat more fruits and veggies into your meals. Snack solutions that are actually good for you! You’ll find quick tricks for understanding nutrition labels & how to tell if a food is a good source of fiber. You know you should “eat better.” Cut down on sugar and salt. Eat more lean protein. It sounds easy enough, but are you confused and hungry for solid information? Join me to reboot you! Want more info? Here you go! What does a dietitian eat for breakfast? Watch to see! Find a FREE download of LiveBest breakfast ideas that are delish and nutrish.